Lorna d'Entremont of Special Needs Book Review has the most comprehensive set of books to help parents and teachers support the needs of children with disabilities. We are happy to support her work. There's a new review of our 2013 update on her site, along with an interview about our project. This new edition has 240 pages; therefore, it is a major update aimed at creating a social support for people with mental health concerns. 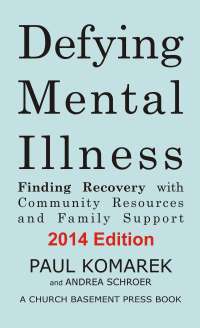 Like their first edition, their updated edition is an excellent resource to help families and friends support their loved one through mental illness, to recovery, and for some, to a thriving life. It is also a great self-help book and my copy of their first edition of Defying Mental Illness is in the hands of a friend with bipolar disorder. Defying Mental Illness is a guide book to recovery from mental illness. It is simply written for all families, friends or the individuals themselves who are looking for advice about the steps to take when mental illness is taking all they have… zest for life, relationships, friendships, career, and a happy childhood and school years.